The days are growing longer and the daytime temperatures are teasing us into thinking spring is truly here. The winter hellebores are joined by the gorgeous crocuses, the early daffodils are unfurling their trumpets while the lilacs are shyly opening their buds alongside the red maples boldly showing off their red leaves awakening from their winter slumber. The birds are a cacaphony of song. Spring is here. Our tastebuds are also awakening from heavy winter foods and are craving fresh flavors. I find early spring with its chill still in the air is one of those in between seasons as far as food is concerned. A spring soup was my solution to satisfy my urge for spring cooking while still finding comfort from the fickle weather. 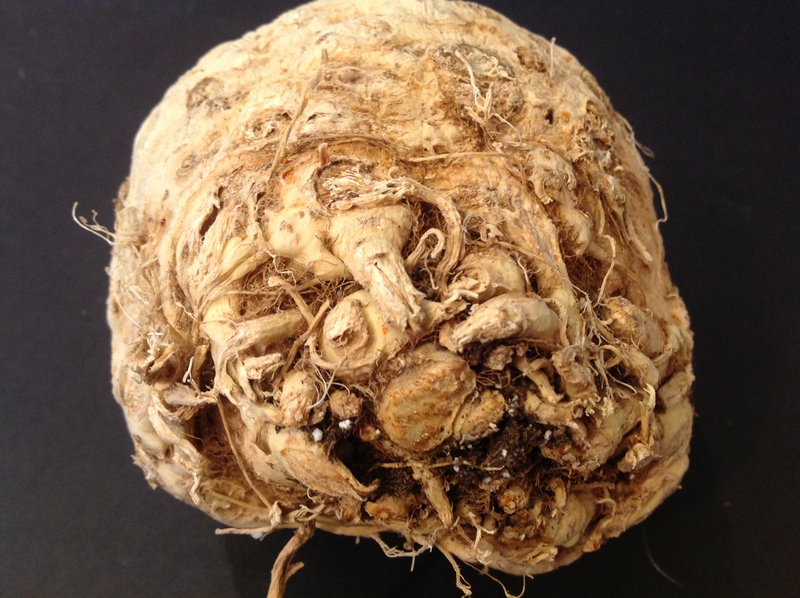 Celery root, also called celeriac or root-celery is related to leaf celery without any of its fibrous texture. It is grown for its knobby underground root and is more popular in Eastern and Northern Europe. It has a distinct delicate celery flavor but it cooks up with a velvety silky texture, ,much like a cream of potato soup. It is low in calories, high in fiber, and a good source of vitamins K, C, B and essential minerals such as phosphorus, iron, copper and manganese(nutrition-and-you.com). 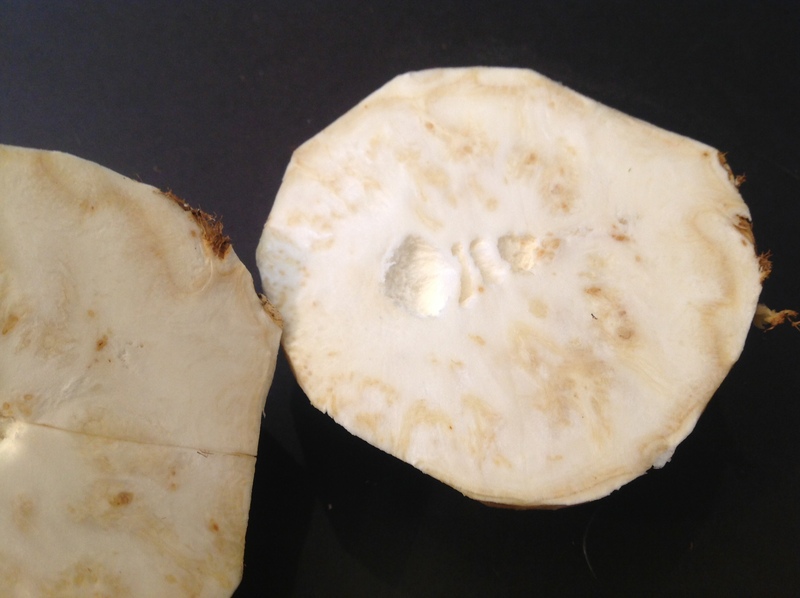 Don’t let the prehistoric looking skin of this root vegetable scare you off from its tasty delicate flesh. 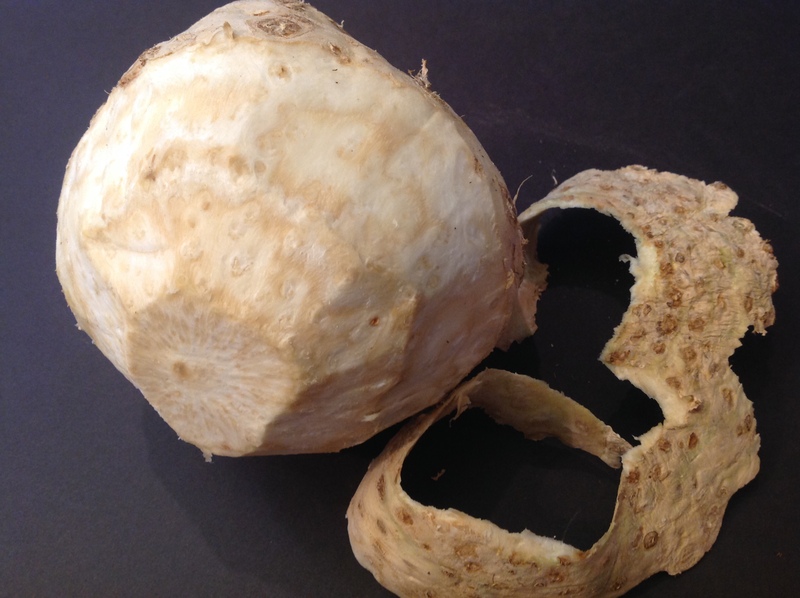 As you peel away the outer skin, the vegetable looks very much like a turnip. The flesh will turn a bit brown when exposed to the air. The puree soup was so rich and smooth, it did not need the addtion of milk or cream. It was a bowl of all vegetable goodness. To add a note of brightness, I drizzled some Meyer Lemon Olive Oil for a dose of omegas 3s, over the top and sprinkled a bit of bacon. You could alternatively serve it with a dollop of sour cream or creme fraiche with some chopped chives. We were bowled over by this nourishing, equally satisfying, lighter soup. Spring is here. Grab your spoon and dig in. In a heavy soup pot, melt the butter and oil together. Add the leeks and cook until translucent. Add the garlic then the chopped celery root, salt then the broth and water. 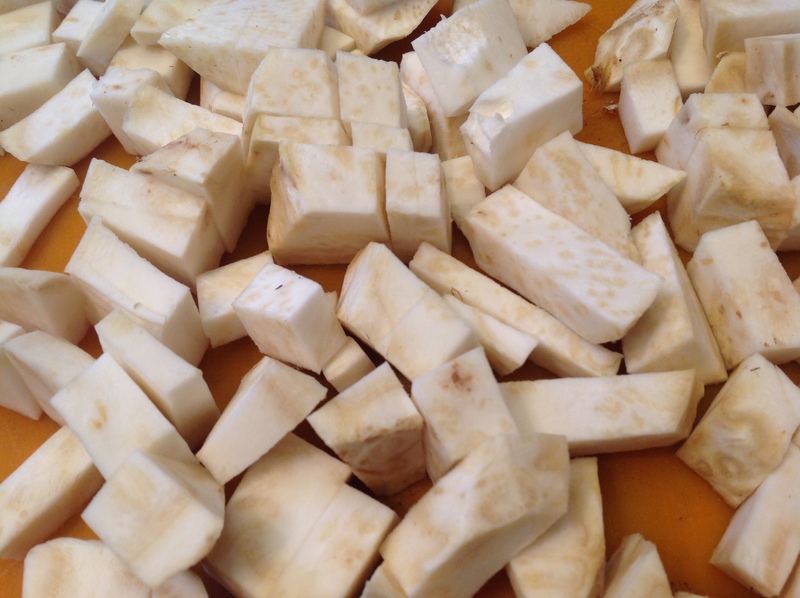 Bring to a boil and reduce heat to cook until the celery root is cooked through, about 45 minutes. Puree the soup in a blender until smooth. Serve with a drizzle of ollive oil and chopped bacon or herbs. This entry was posted in Gardening, Recipes and tagged celeriac leek soup, cream of celeriac soup, creamy celery root soup, dairy free cream of celeriac soup, dairy free cream of celery root soup by Johanne Lamarche. Bookmark the permalink. It does! Or it looks like a brain?! Johanne, I love celery-roots and leek in all kind of variations! And while your soup sounds very good, I think I want to tell you that (being from Europe) celery-roots and also leeks are definitely not a spring vegetable. They are seeded in the spring and harvested in the fall and can be (properly) stored for a longer use well into winter. Of course, nowadays you can buy almost anything from anywhere in the world any day of the year. Call me old-fashion, but when I grew up, these were not vegetables you could buy fresh in March or early spring. I am having a hard time making dishes in warm weather with these beloved vegetables. Luckily, our current weather does not know whether it is spring or still winter, so I am still enjoying my winter veggies! Hi Helga. I always love to hear from you! I know celery root is a winter vegetable but it was using it in a lighter soup for a transitional meal out of winter toward spring I intended to write about. You are so right about having lost the distinction between true seasons with our vegetables coming from all over the world. One delicious exception I know you will soon celebrate is white asparagus which is just incomparable from that in Springtime Germany! One day I will fly over just for that! It does look like a brain! Such a fun veggie!! Looking forward to Tuesday as well Loretta. Get ready for some awesome food: those International women know how to cook! Thank you for featuring one of my favourite vegetables, and one that is barely known in this part of the world. Your soup looks delicious, and the spring flower pictures are a delight. We still have that to look forward to, but it shouldn’t be long now. i think the virtues of this vegetable are overshadowed by people not knowing how to use it. hopefully this post will have encouraged some cooks to try it. what is your favorite way to eat it Hilda? Thanks Johanne – I’m still in SD helping out the folks, but it DID snow today!! And that was what I said, Ides of March…et tu snowstorm!! Nothing is blooming here, yet…miserable prairie weather!! Sending you wonderful PA spring bulbs in bloom. 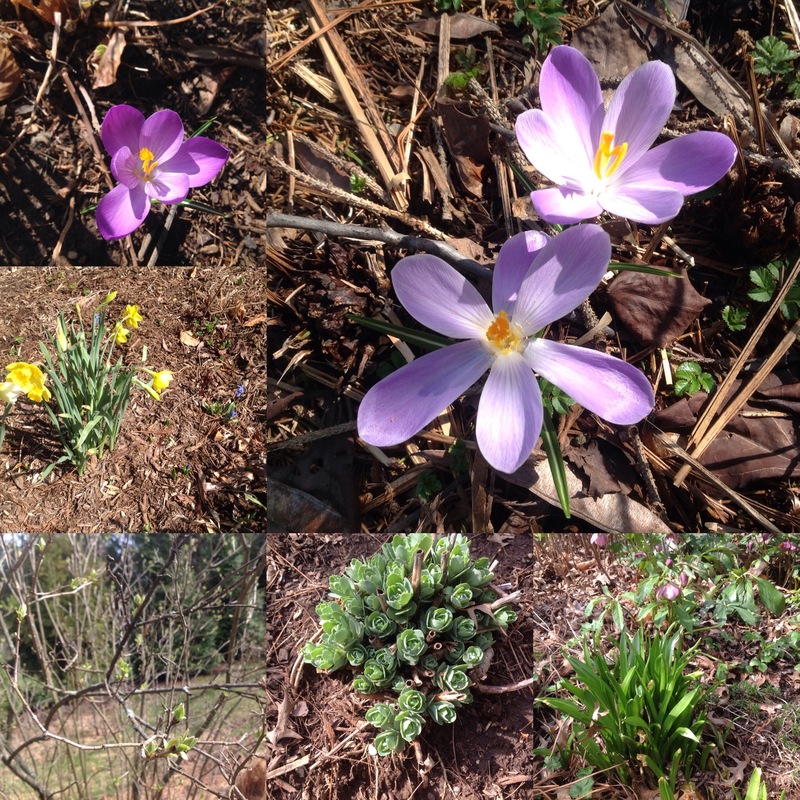 🌷🌷🌷 home is -10 today w snow….spring was never anything more than dirty snow melt up there. I am impresssed you are still so active in spite of your devotion to your parents in SD Mollie. you are such a good daughter!